Voice Over Artist and Voiceovers from Jeff M.
Voice Over Artist and professional commercial Voiceovers. 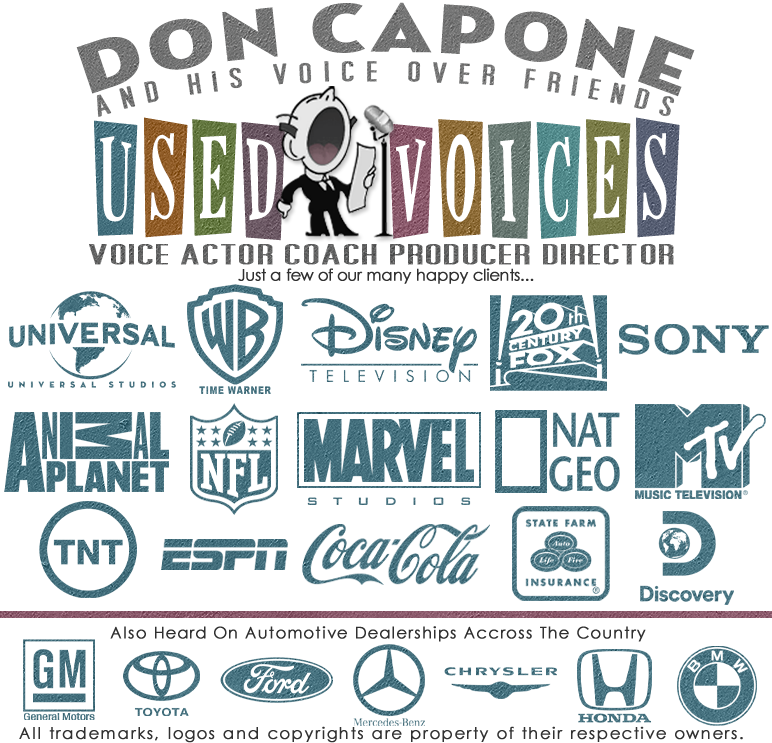 Professional Voiceover Promo for TV, and Movie Trailers. Voice description: Dry rub, medium-rare, well seasoned and bursting with flavor. If it sound like the best slab of beef you've ever had, you're right. Extremely wide range and if there is anything that has to do with the spoken word, this guy has done it. All except for audio books out of choice, because Jeff is more of a quarter horse, than a marathon runner. Impersonations, Characters, Dialects and Accents include: Jeff M. is a professional voice impressionist who began emulating cartoon character voices as a child and developed over 60 different celebrity voices by the time he was in his early 20's. He is also one of the most accomplished singing impressionists in the world, with nearly 500 vocal tribute videos posted to YouTube, with over 1,000 worldwide subscribers and nearly 2 million views to date. On the weekends, he fronts his own classic rock band, replicating the voices of rock 'n roll's greatest artists, including Mick Jagger, Jim Morrison, John Fogerty, Neil Young, John Lennon, Tom Petty and dozens more. Jeff also speaks convincingly with Australian, English, South African, German, French and Eastern European accents. Experience: Two decades as a top-rated, major market radio personality in Los Angeles, San Francisco and San Diego before retiring from radio in 1997 to concentrate solely on voice acting in Los Angeles. Jeff M. served as one of the longest running promo voices for KNBC-4, NBC's West Coast flagship TV station for nine consecutive years, and has been the voice of the National Geographic Channel, DirecTV, AT&T U-Verse, Nordstrom, McDonald's, Autozone, Deutche Bank, Kentucky Fried Chicken and countless film studios including Warner Brothers, Disney, etc., as the trailer voice for dozens of feature-length films, including two in which his voice was featured as part of the film itself. From national and international commercials to infomercials, from theatrical trailers and promos to network television promos, to industrial narration, animation, video games and more, there isn't a facet of the VO world that hasn't included the voice talent of Jeff M.
Age Ranges: Early 30's to death rattle and everything in between. Production services: All files delivered in the highest resolution .AIF or .WAV, dry voice with anything superfluous to the actual copy itself removed within minutes of the session. Fast file turnaround for phone patch sessions. Usually within 10-5 minutes of session. Studio Equipment Custom-built microphone based on Neumann U47 circuit with Thiersch large diaphragm capsule, Neumann TLM-103, Sennheiser 416, custom-modified Pearlman TM-1 with EF14 tube, Requisite PAL Plus MkIII tube mic pre, Telos Zephyr XStream ISDN codec, phone patch, Vocal booth. Home Base: Los Angeles, CA, U.S.A.